Regulars at Higham will know my relief when I can tell you that, finally, the front upper windows are getting repainted and repaired. Our 1828 gothic revival building has parts that are inaccessible to ladders, and so full frontal scaffolding has been errected. Apparently last time this was done, they were allowed to use ladders!!! Win this wonderful framed oil painting by artist Linda Birch. Our Tutor Chi Zhang, in a video by Edinburgh and Lothians Regional Equality Council, speaks about moving to Scotland from China to study graphic design, living in Edinburgh, his work as an artist, calligrapher and teacher at the award-winning Confucius Institute in Edinburgh. What goes on on a typical art Course with Robert? 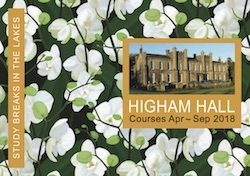 One of our most popular art tutors, Brian Smith, may be moving away from the local area soon, so if you wish to benefit from his popular WATERCOLOUR DAYS and ACRYLIC DAYS, you have him for day courses at Higham only until March! SEE BRIAN’S COURSES So, take advantage of Brian’s days whilst you can! Brand New courses: REIKI WEEKENDS at Higham! A book by Tutor Robert Dutton! Just about got Monty to sit long enough in the new Curve to capture a shot of him with the new plaque, cunningly installed on a tree trunk by Neil the gardener. Alston Hall was, until the beginning of last year, a sister college to Higham based in the Ribble Valley in Lancashire. We shared many tutors and, indeed, students, and strived to be true to the same aims of lifelong learning, at one time both being part of the, now defunct, Adult Residential College’s Association (ARCA).